Game of Thrones wedding dress. Custom made. 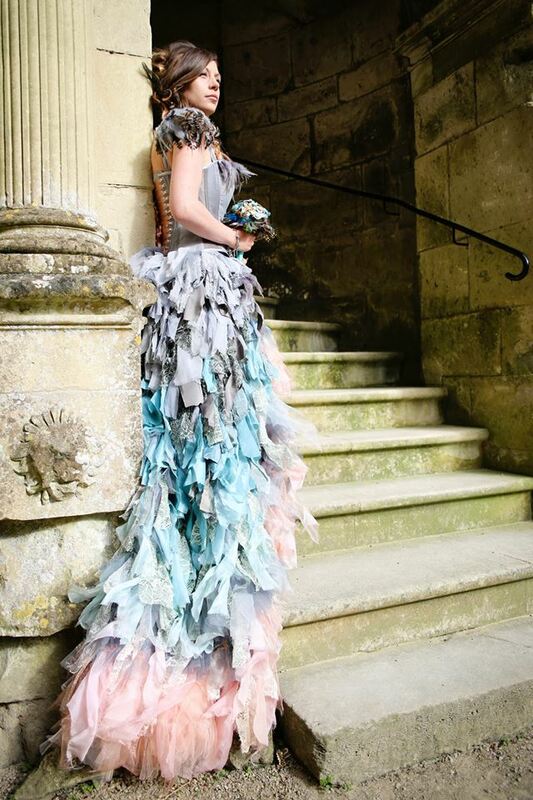 Corset, skirt and bustle in grey turquoise and peach silk, taffeta, lace, chiffon and tulle. Alternative/ steampunk couture wedding dress / prom gown. Cinderella. Handmade, completely unique- I strictly never make 2 identical items. Fully steel boned corset. Drapey ‘rag’ skirt made from tulle, lace, chiffon and organza, etc, short front, long back. Matching bustle with chiffon and ribbons. (Feather details are not included). Bohemian and ethereal, woodland princess dress. Steampunk alternative costume bridal wear. Photography by Jay Spicer and John Worsfold. Very interesting website i have bookmarked lyndseyclarkboutique.co.uk for future reference.